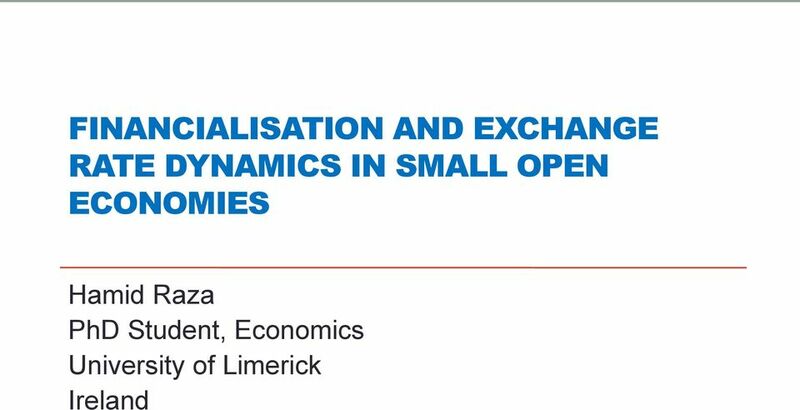 Download "FINANCIALISATION AND EXCHANGE RATE DYNAMICS IN SMALL OPEN ECONOMIES. Hamid Raza PhD Student, Economics University of Limerick Ireland"
2 Financialisation Financialisation as a broad concept refers to: a) an overall increase in financial activities of various kinds b) introduction and use of new financial instruments. 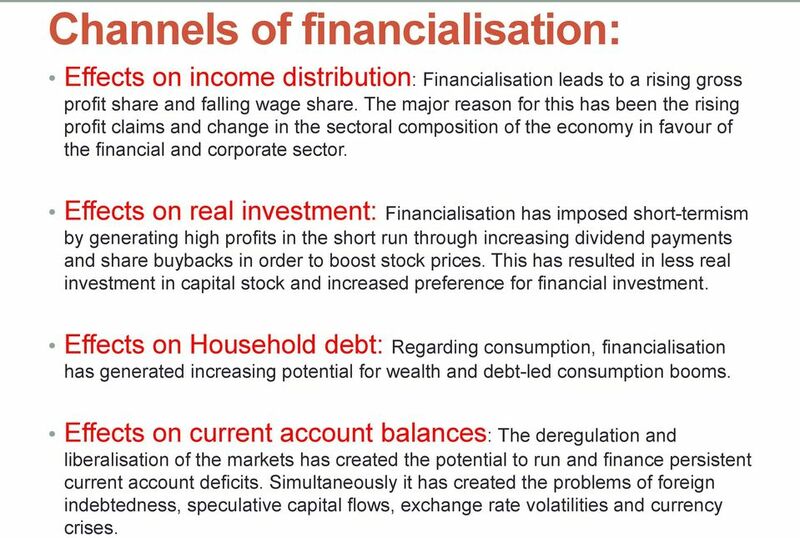 The concept of financialisation is slightly different than the concept of financial development in the literature. 3 Channels of financialisation: Effects on income distribution: Financialisation leads to a rising gross profit share and falling wage share. The major reason for this has been the rising profit claims and change in the sectoral composition of the economy in favour of the financial and corporate sector. 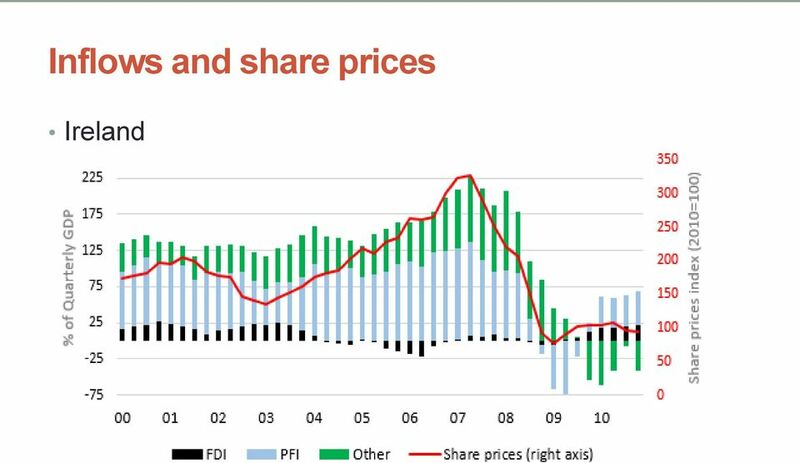 Effects on real investment: Financialisation has imposed short-termism by generating high profits in the short run through increasing dividend payments and share buybacks in order to boost stock prices. This has resulted in less real investment in capital stock and increased preference for financial investment. Effects on Household debt: Regarding consumption, financialisation has generated increasing potential for wealth and debt-led consumption booms. 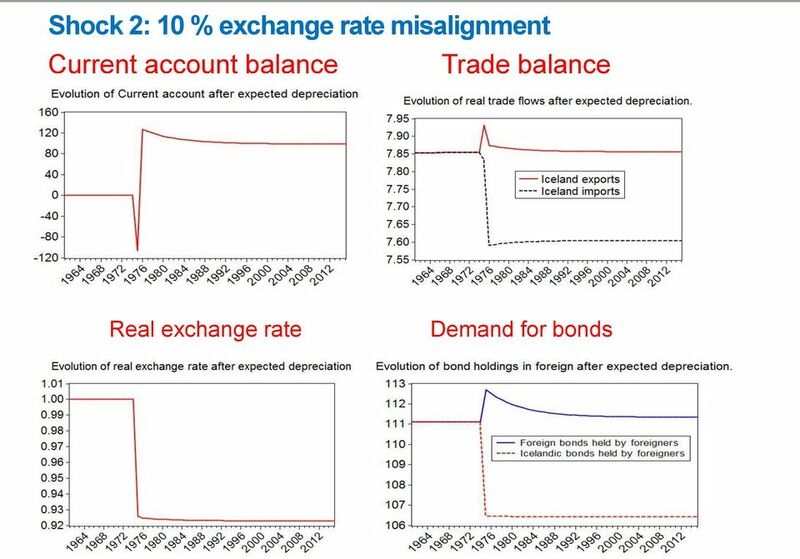 Effects on current account balances: The deregulation and liberalisation of the markets has created the potential to run and finance persistent current account deficits. Simultaneously it has created the problems of foreign indebtedness, speculative capital flows, exchange rate volatilities and currency crises. 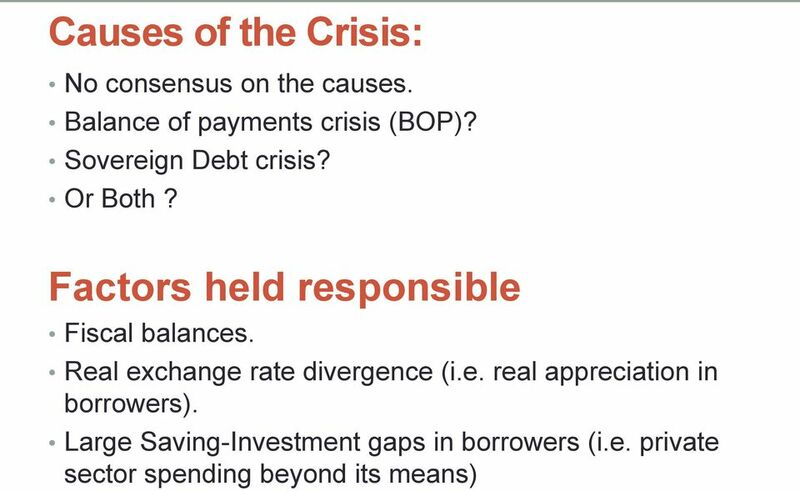 4 Overview of the crisis External Imbalances Large macro imbalances between creditors and borrowers. Persistent current account deficits. 6 Proposed solutions: Correction of fiscal balance. Improving real exchange rates Or both Policy recommendation: Austerity (Assumption 1: Improved fiscal balance boosts confidence (both consumer and investor). 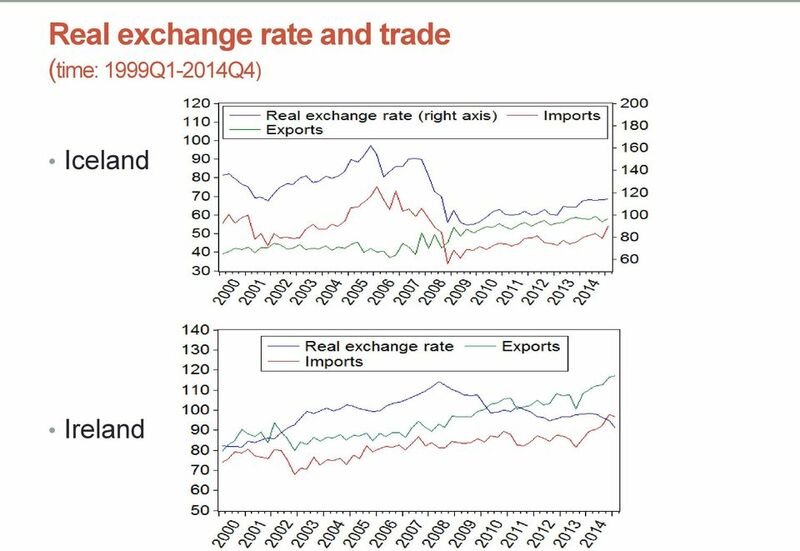 (Assumption 2: Targeting real exchange rate would increase export growth (improve trade balance). 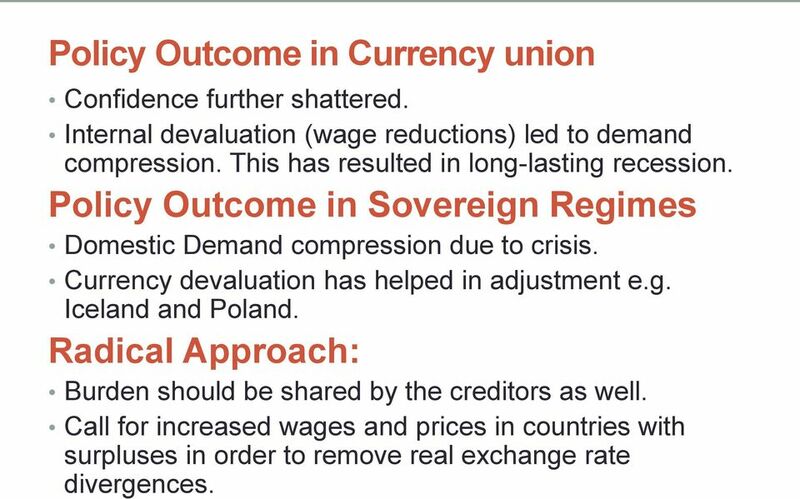 7 Policy Outcome in Currency union Confidence further shattered. Internal devaluation (wage reductions) led to demand compression. This has resulted in long-lasting recession. Policy Outcome in Sovereign Regimes Domestic Demand compression due to crisis. Currency devaluation has helped in adjustment e.g. Iceland and Poland. Radical Approach: Burden should be shared by the creditors as well. Call for increased wages and prices in countries with surpluses in order to remove real exchange rate divergences. 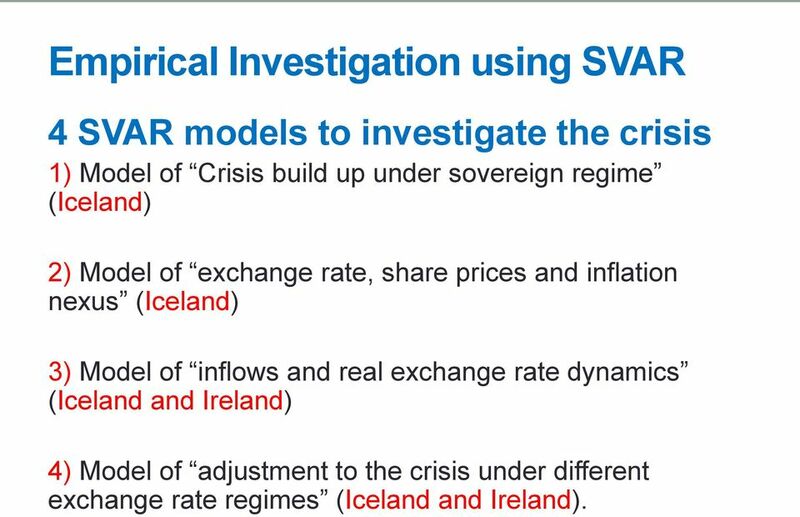 17 Empirical Investigation using SVAR 4 SVAR models to investigate the crisis 1) Model of Crisis build up under sovereign regime (Iceland) 2) Model of exchange rate, share prices and inflation nexus (Iceland) 3) Model of inflows and real exchange rate dynamics (Iceland and Ireland) 4) Model of adjustment to the crisis under different exchange rate regimes (Iceland and Ireland). 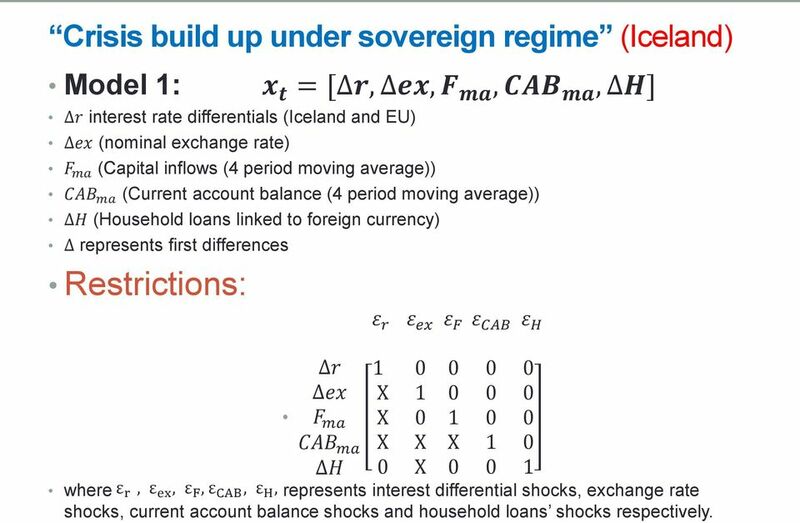 18 Crisis build up under sovereign regime (Iceland) Model 1: r interest rate differentials (Iceland and EU) ex (nominal exchange rate) F ma (Capital inflows (4 period moving average)) x t = [ r, ex, F ma, CAB ma, H] CAB ma (Current account balance (4 period moving average)) H (Household loans linked to foreign currency) represents first differences Restrictions: r ex F ma CAB ma H ε r ε ex ε F ε CAB ε H X X X X X X where ε r, ε ex, ε F, ε CAB, ε H, represents interest differential shocks, exchange rate shocks, current account balance shocks and household loans shocks respectively. 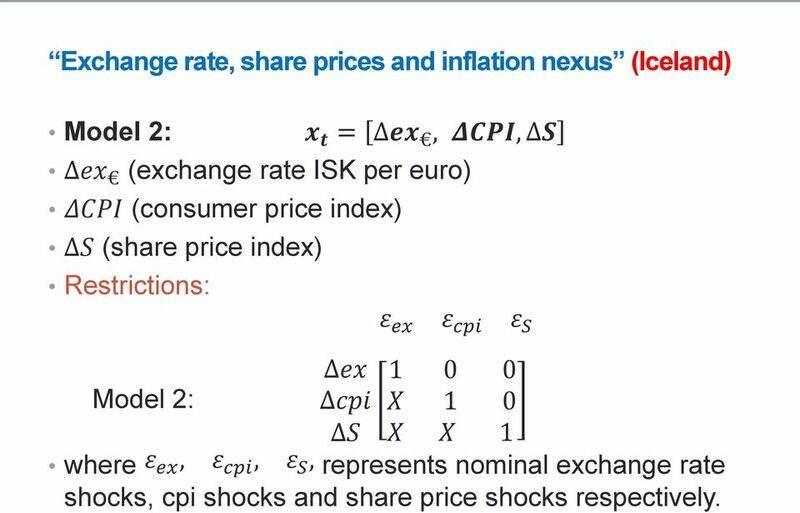 19 Exchange rate, share prices and inflation nexus (Iceland) Model 2: x t = ex, ΔCPI, S ex (exchange rate ISK per euro) ΔCPI (consumer price index) S (share price index) Restrictions: Model 2: ex cpi S ε ex ε cpi ε S X 1 0 X X 1 where ε ex, ε cpi, ε S, represents nominal exchange rate shocks, cpi shocks and share price shocks respectively. 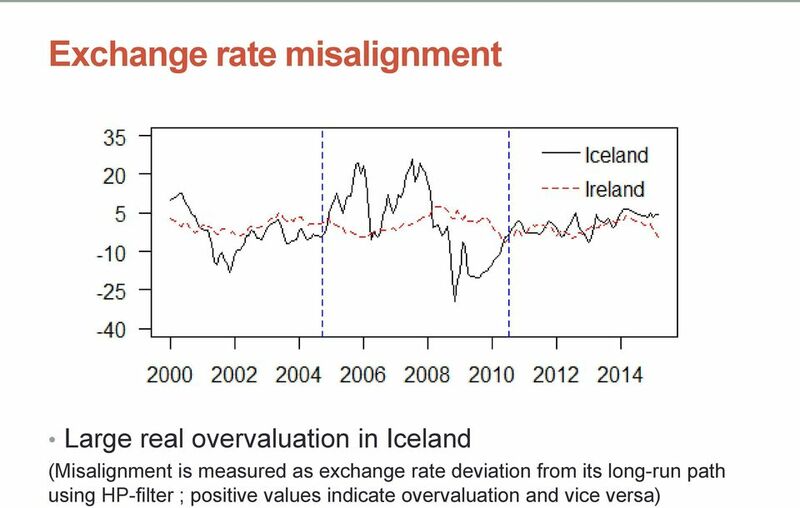 20 Inflows and real exchange rate dynamics (Iceland and Ireland) Model 3: x t = [ Rex, FDI ma, PFI ma ] ΔRex represents the log difference of the real exchange rate. 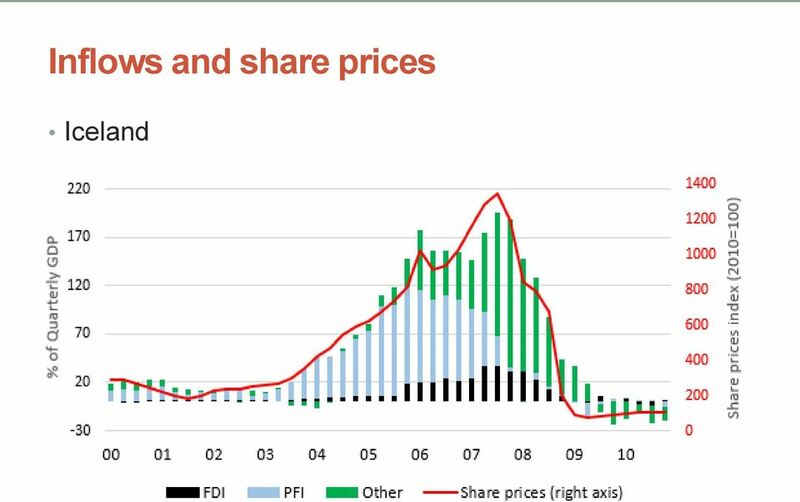 FDI ma and PFI ma represents the moving average of Foreign Direct Investment to GDP, Portfolio Investment to GDP. 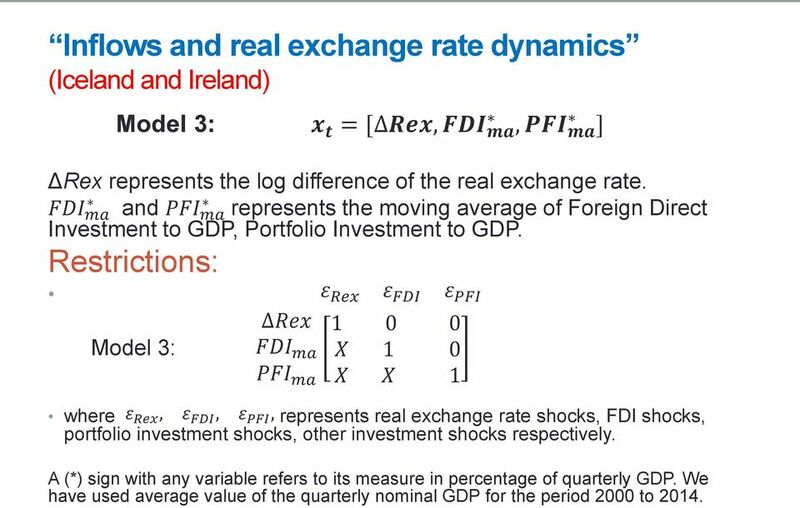 Restrictions: ε Rex ε FDI ε PFI Model 3: Rex FDI ma PFI ma X 1 0 X X 1 where ε Rex, ε FDI, ε PFI, represents real exchange rate shocks, FDI shocks, portfolio investment shocks, other investment shocks respectively. A (*) sign with any variable refers to its measure in percentage of quarterly GDP. We have used average value of the quarterly nominal GDP for the period 2000 to 2014. 21 Adjustment to the Crisis under different regimes (Iceland and Ireland) Model 4: x t = Rex, D, CAB ma ΔRex represents log difference of real exchange rate, ΔD represents the log difference of domestic demand CAB ma represents current account balance to GDP Restrictions: ε Rex ε D ε CAB Model 4: Rex D CAB ma X 1 0 X X 1 where ε Rex, ε D, ε CAB, represents real exchange rate shock, demand shock, current account balance shock respectively. 28 Conclusion Large financial inflows make economies vulnerable to external conditions and create large exchange rate misalignments. It is important to analyse inflows from a demand (recipient) and supply (investors) perspective. 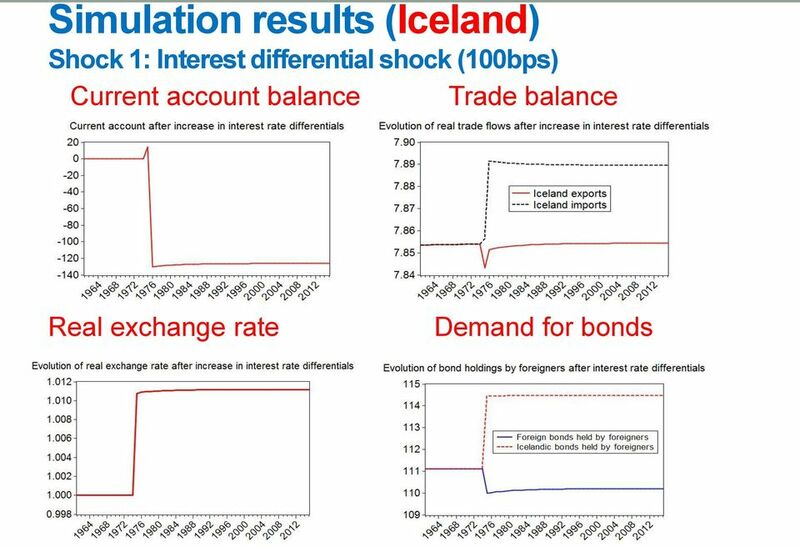 Sovereign regimes can adjust through external devaluation (Iceland). Recovery in a currency union (Ireland) is more painful due to internal devaluation and has failed on practical grounds so far. Other contrasting examples are Poland and Greece. Overcoming the Debt Crisis and Securing Growth- Irreconcilable Challenges for the Euro-zone? ECONOMIC RESEARCH & CORPORATE DEVELOPMENT Financial Market Outlook February 25, 2011 Dr. Michael Heise Euro area sovereign debt road to ruin or salvation? EURO AREA SOVEREIGN DEBT ROAD TO RUIN OR SALVATION? Czech Republic: Shore in Sight? 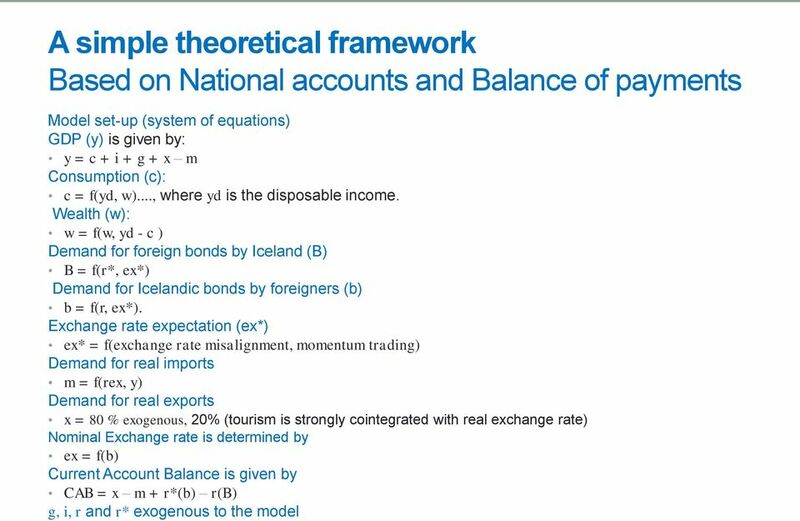 Errors and omissions in the balance of payments statistics a problem? Commentary: What Do Budget Deficits Do?